Matt Stoller a great assessment up of the elections, the netroots and Rummy's firing. Matt also goes into what impact Rahm actually didn't have. TNR also has a summary up and saying that the greatest impact came from the netroots (ht Mo from the comments). 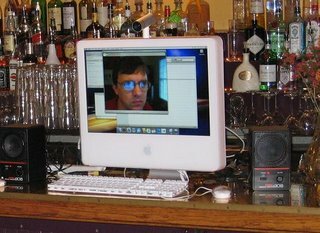 And that is the InstaPundit himself, Glen Reynolds joining in via webcam at last night's blogger party. "Just saw them saying on CNN that 'Corruption' was the number one issue mentioned by voters in exit polls. If -- and it's a big "if" -- this is an accurate reflection I think the GOP will wish it had passed all those promised ethics reforms that it didn't deliver," says Glenn Reynolds at Instapundit.